What can I beemind with Fitbit? All goals are Do More goals except for calories eaten (Do Less), weight & body fat (Weight Loss), and net calories (a unique custom type). Do I need to sync my Fitbit every day? When Beeminder checks for data, we'll look at the last 7 days of Fitbit data and update any datapoints that are out of sync with Fitbit. No worries about going off the grid and not syncing for a weekend — you will automatically be caught up when you return and sync your weekend steps. If you have derailed because you didn't sync in time, no problem. Sync your data and reply to the legitimacy check to have your derailment undone! I deleted my datapoint in Beeminder, but it came back! Because of the 7-day lookback, any deleted or edited datapoints will be replaced with Fitbit's value for the day. If this data is incorrect for any reason, you'll need to modify it in Fitbit directly or contact Beeminder support for a workaround. How much Fitbit history does Beeminder access? When you create the goal, we'll import all the available data for that metric, but your graph will only show starting on the goal creation date. I'm doing steps, but they don't seem to show up on the right day in Beeminder. Double-check that your Fitbit timezone and your Beeminder timezone are in agreement. 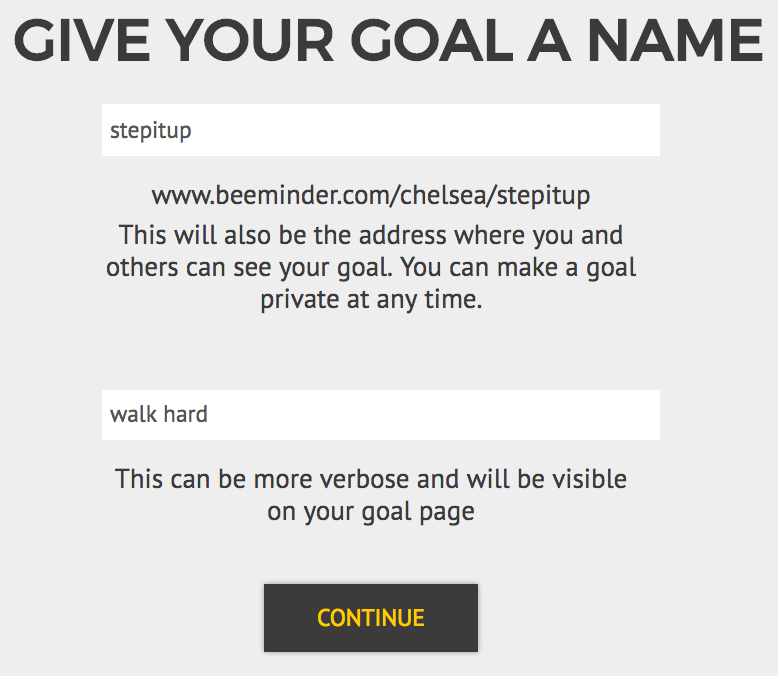 Head to create a new goal (also accessible through the New Goal link in the top menu). Click the Fitbit icon to start a new goal using Fitbit data. First, select the metric you want to track using the dropdown menu. For this goal, I'm doing steps. 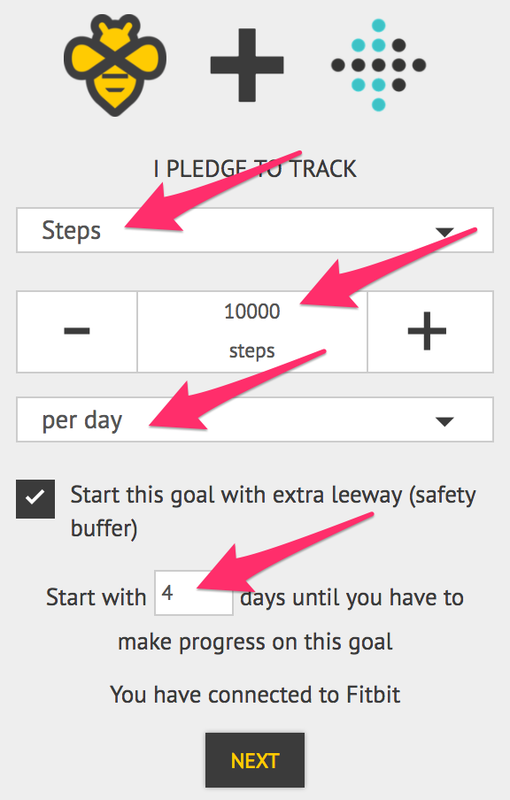 Then enter the amount that you want to commit to using the two fields below - this goal will be 10000 steps per day. If you want to delay your goal's start a few days (maybe you're traveling this weekend), be sure to tick the Start this goal with extra leeway box. Enter the number of days you want to delay and press Continue. Give your goal a brief name. If you want, you can also write a short description with more information. And that's it! 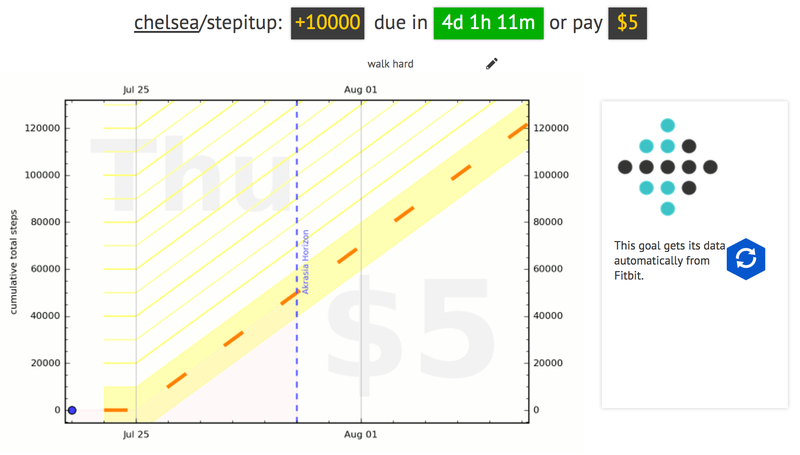 I'll need to start stepping in the next 4 days to avoid paying Beeminder my first $5.